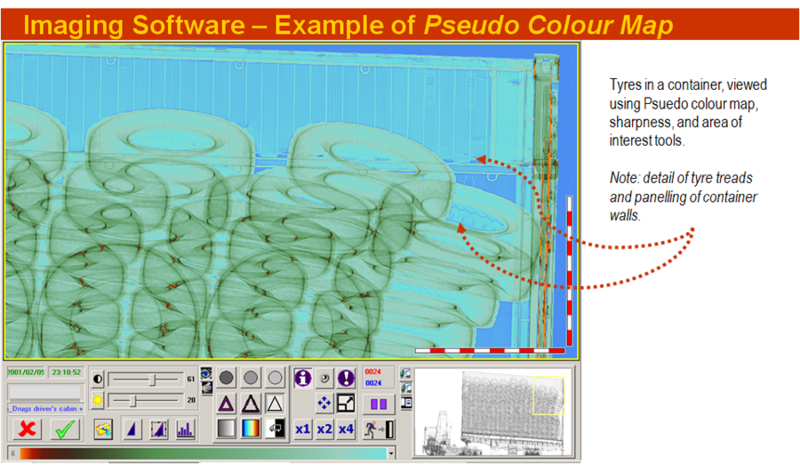 Scanner Procurement Basics « What Happened to the Portcullis? 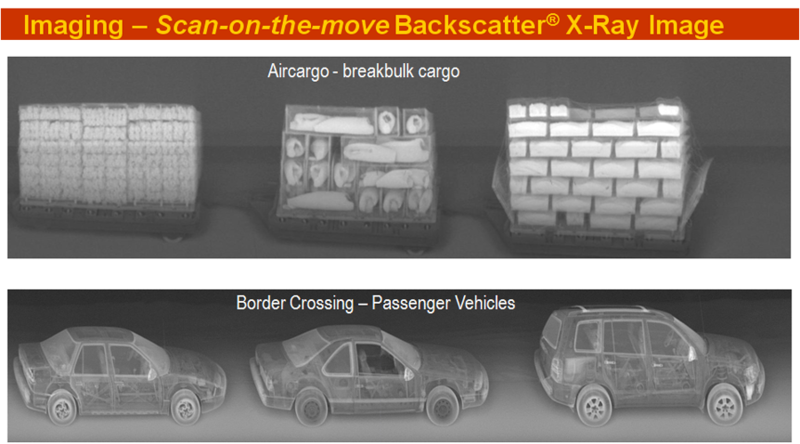 Ever since the era of heightened cargo security began – circa 2002, or specifically post 9/11 – most customs administrations have at one stage or another ventured into the scanner market. 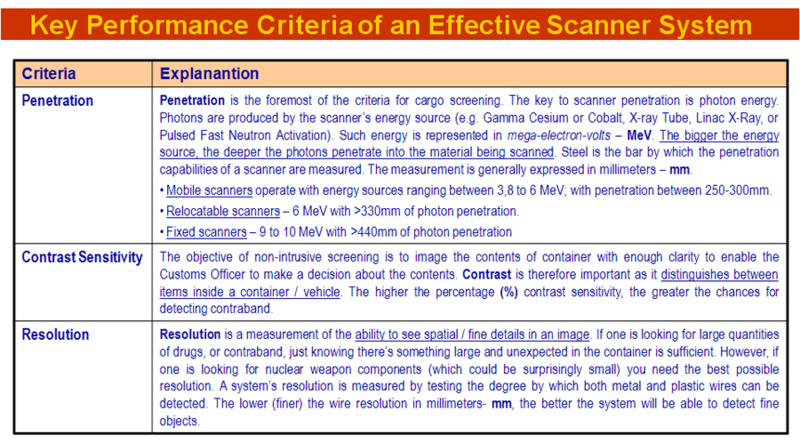 The WCO acknowledged the importance of the use of scanners as non-intrusive inspection equipment and published its Guidelines for the Purchase and Deployment of Scanning/Imaging Equipment. Its first publication was in 2003, but due to the development of activity in this market it became more and more necessary to keep member administrations informed and provide at least a high-level set of criterion – particularly given that for many administrations this is not a core business activity, and less an area of expertise. The guide was therefore updated and republished again in 2009. 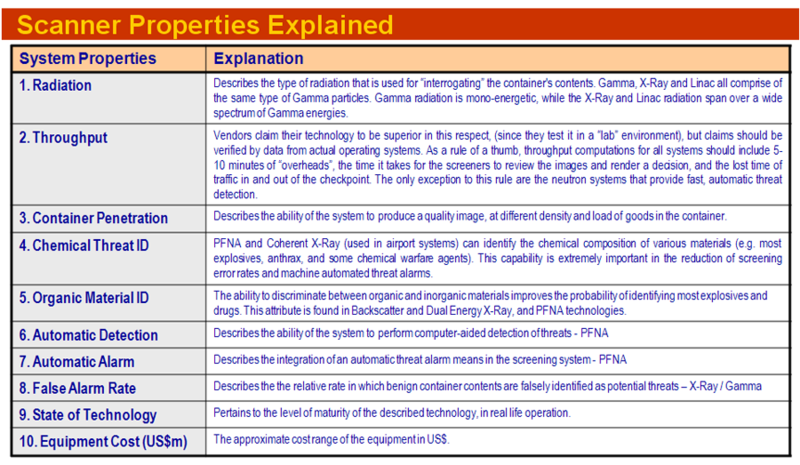 The security and detection industry is by its very nature an unregulated and to a large extent clandestine industry. In South Africa, government authorities were insistent on the local customs administration assessing and analysing this market and its developments to ensure that it procured equipment that would withstand the extreme conditions of the country’s varying climatic conditions; and moreover, manufacturer’s who would be able to not only maintain such equipment but also offer upgrades as the technology matured. A glimpse at any scanner supplier’s website is evidence enough – they are devoid of any specification, scant on description, therefore providing very little insight for a customs administration. Hence, when putting out a tender it is wise for a customs administration to request detailed specifications as part of the evaluation criteria. If necessary, the manufacturer must produce scientific and practical proof to support its claims. The aim of this page is to provide ‘others’ (specifically developing countries) with some guidance on what to consider in the approach to and procurement of scanning equipment. It is therefore not to detract upon what many specialised consultancies and service providers in this market offer, but hopefully create some awareness from a customs administration’s point of view on the subject, before it chooses a business partner. Transportation modalities at the border/frontier. Proximity to data connectivity (particularly the customs risk system). Secondly, ‘non-intrusive inspection’ equipment is not an end in itself, but a component of a broader customs border enforcement strategy. Therefore, a lot of consideration must be given to the integration of this technology into already existing framework of the customs border presence. This will involve things like staffing, deployment and training, review of working conditions, observance of occupation health and safety regulations, etc. Typically, scanner equipment will have at least a 15 year period of operational service; therefore an administration must always consider future growth in border activities, more cargo, more passengers/travellers, and possible longer working hours – and build a trustworthy relationship with the service provider. 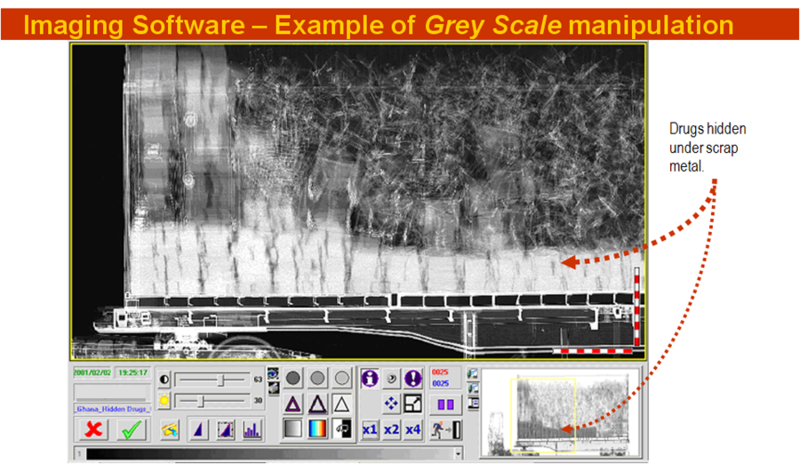 While scanner inspection equipment can be operated using traditional targeting approaches, they will most certainly not be utilised efficiently. 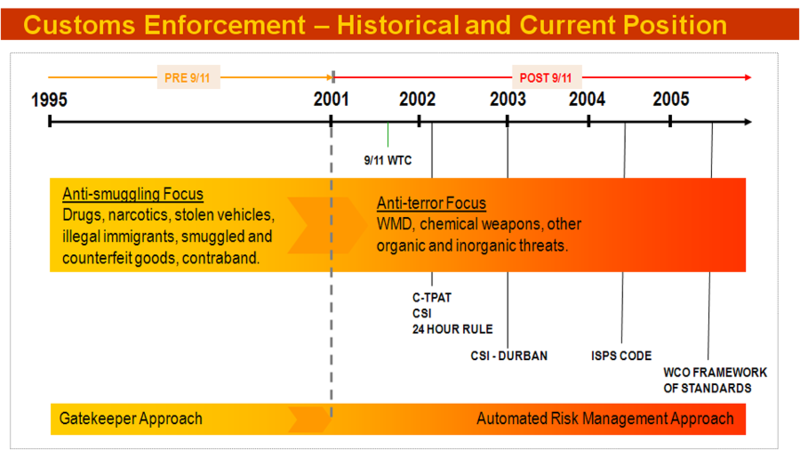 This is quite evident from the dramatic change in approach since the events of 9/11. More and more customs administrations are adopting automated targeting systems thereby consolidating their risk management capability. Cargo scanning apparatus has been around for several years. Some administrations have utilised this equipment for several decades. Initially, the first equipment was large and required significant reinforced walling to secure radiation, costing several millions of dollars. 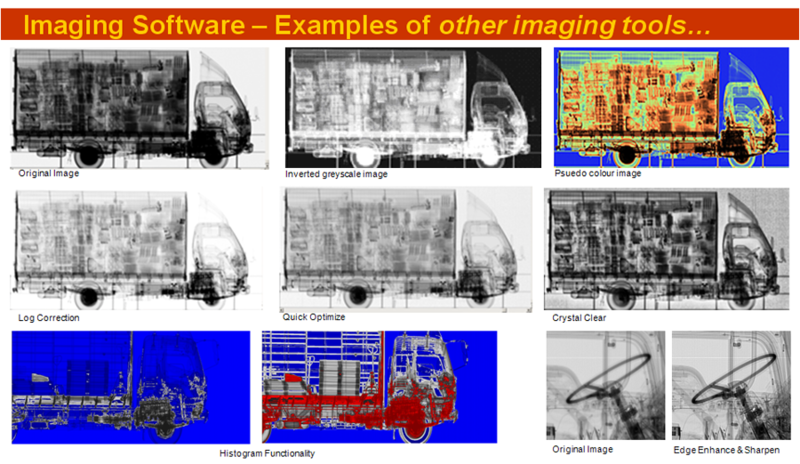 Today, scientists and engineers have been able to develop scanner devices for conveyance on the back of mobile trucks and vans. 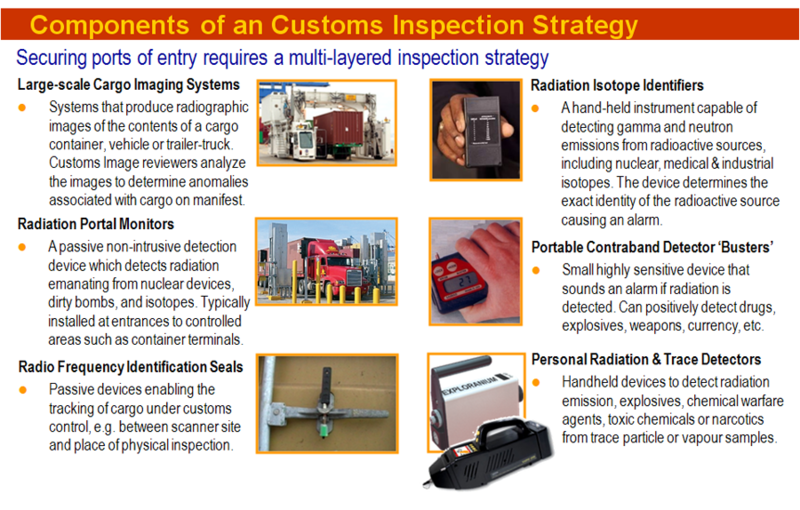 This has helped reduce costs, as well as provide the customs administration the ability to relocate its inspection tools as and when risk dictates. It is a well-known fact that secure borders result in higher risks at less secure ports or border crossing points. Therefore, besides the technology, it is important for the customs administration to determine what type of scanner (fixed or mobile) will best fit the application at its ports of entry. Most customs administrations find adequate coverage and support amongst the so-called ‘proven’ technologies. Herein lies the first critical consideration – availability of a landsite. Real estate at any busy port or border crossing comes at a premium, if at all. Whether or not a specialised consultancy or scanner manufacturer is involved in the deployment process, the customs administration must take charge of negotiations with the resident landlord for the best available landsite. Above all it strengthens the ties and influence which customs holds at that port. The site is also only as good as its ability to be linked or integrated into the traffic flow of the port. At worst it must not create a bottle neck to other commercial activities at the port. 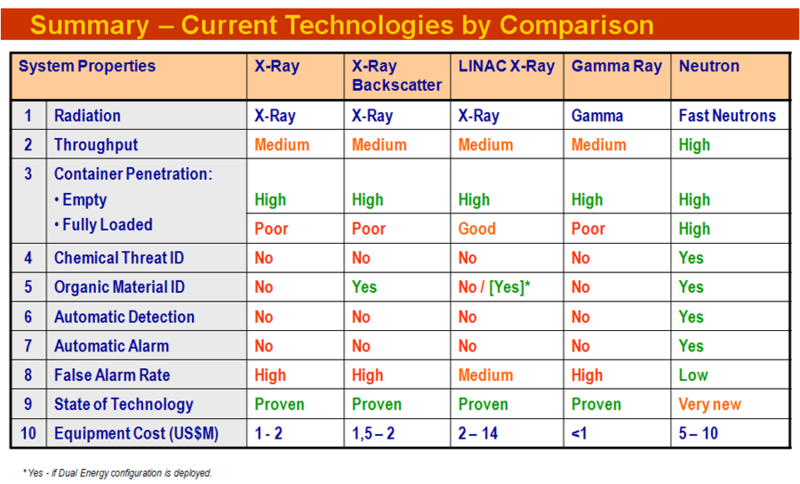 The table below helps to summarize some of the key characteristics of available scanner technologies. Obviously, at the end of the day, it all boils down to the budget – being the price the organisation or government is willing to pay for secure borders. 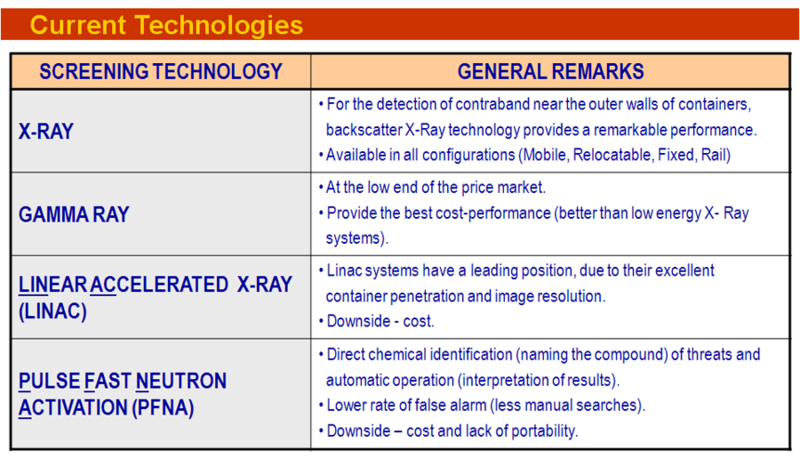 Now having a better appreciation for what the different technologies provide, let’s consider the key performance features of a customs scanner system in the modern era. 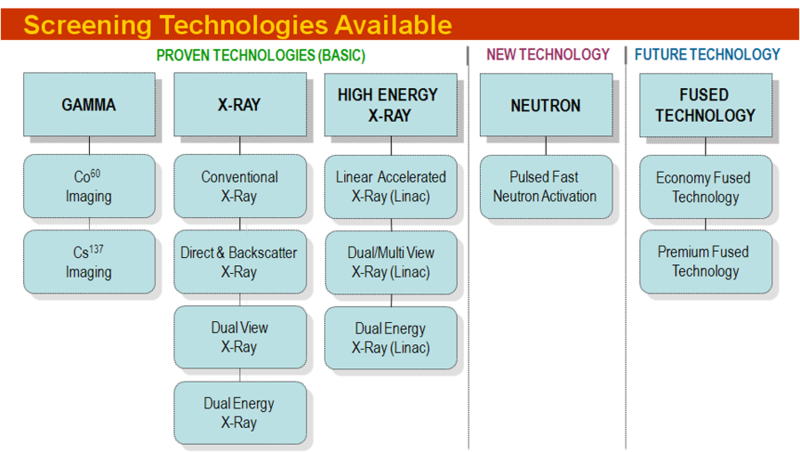 Obviously, newer generation neutron scanners provide the best overall coverage for all criteria, but at a significant price and requires a fixed facility to operate. 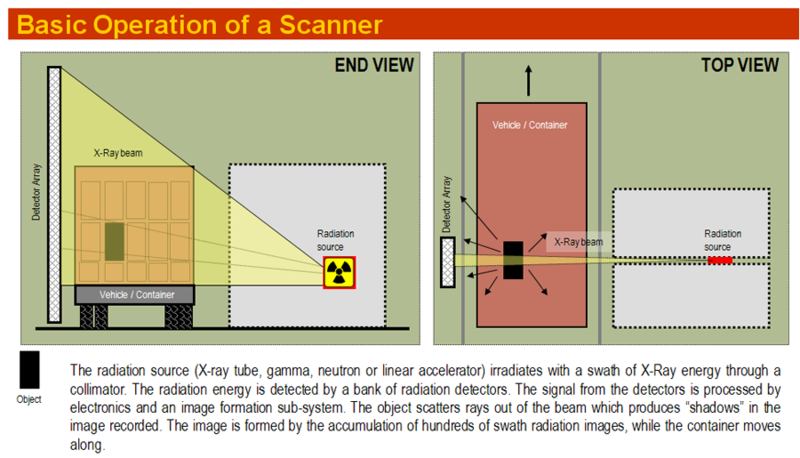 It is however important to note that many manufacturers of X-Ray based scanners are today able to ‘fuse’ this equipment with ‘radiation threat detection’ technology which enables improved capability in detecting the presence of organic threats. This also improves the false alarm rate. Now let’s consider briefly the operation of a cargo scanner. While most manufacturers provide adequate training in the operational use of their scanner equipment, it is important for the host customs administration to ensure that all the technical radiation criteria of the equipment meets the country’s public health and safety regulations. The government authority vested with this authority must be notified of customs procurement intentions well in advance to mitigate any potential embarrassment upon arrival of such equipment into the country. Where a country’s national law does not specify any requirements in this regard, it is always good to ensure that an internationally recognised authority, such as the International Atomic Energy Agency (IAEA) is used as a basis. Like any equipment or apparatus, the technical specifications are one aspect, normally used my manufacturers to impress prospective clients. The real value lies in the after sales maintenance and support, as well as the customs operators’ ability to extract the maximum value from such equipment. 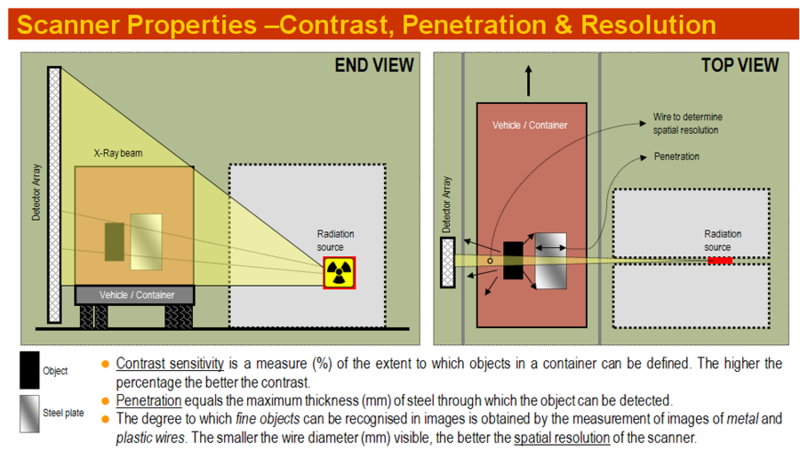 Customs image analysts and scanner operators are not required to be nuclear physicists. Neither do they require a university degree to operate the equipment. They must however understand the application for which a cargo scanner is intended, and operate according to the manufacturer’s specification otherwise warranties and agreed performance criteria will be breached. 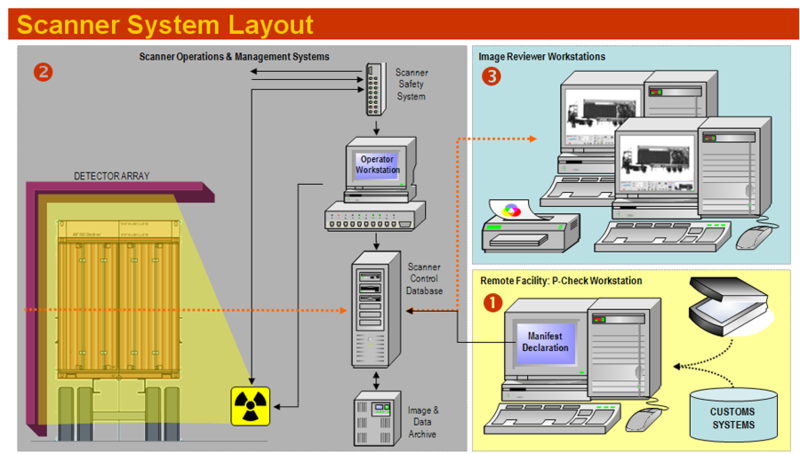 All members of a scanning team must have sufficient awareness of what each party’s role is and display visual awareness when every operating within the scanner facility to avoid unfortunate accidents. Above all scanner staff must observe the command and control of the scanner facility ‘team leader’. A scanner site or facility is a place of discipline and order, and where observance of health and safety must be demonstrated. Depending on the nature and size of the scanning facility it is worthwhile for the customs administration to consider command and control via two-way radio. Some specialist consultancies provide training in the use and operation of such equipment. It furthermore instills discipline within the team on site, and can obviate misunderstandings or even accidents when commands are issued. 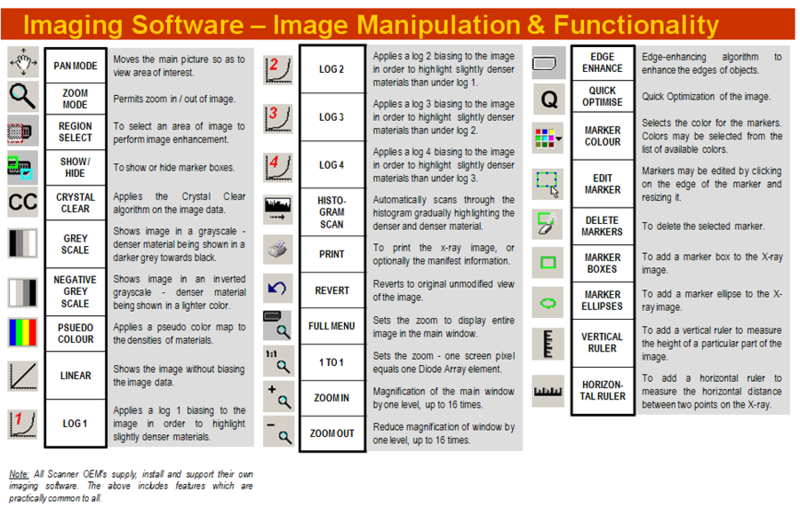 Ability to input/import customs declaration or manifest information into a sub-system for screening by a customs image analyst. 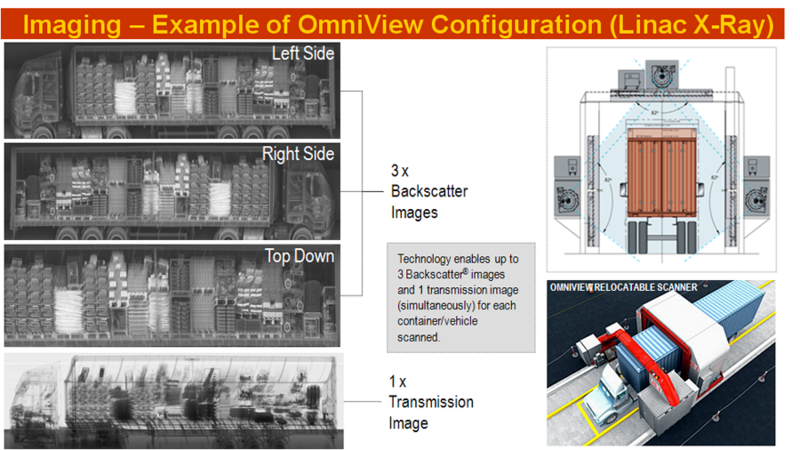 Ability to direct identified traffic/cargo into, within, and from the scanner facility. Ability to perform a tailgate inspection, if and when required. Ability to notify port/border authority of cargo status/release. Ability to be notified (by the customs system) of an impending inspection. Ability to interface with a database containing supporting documents relating to an impending scan inspection. 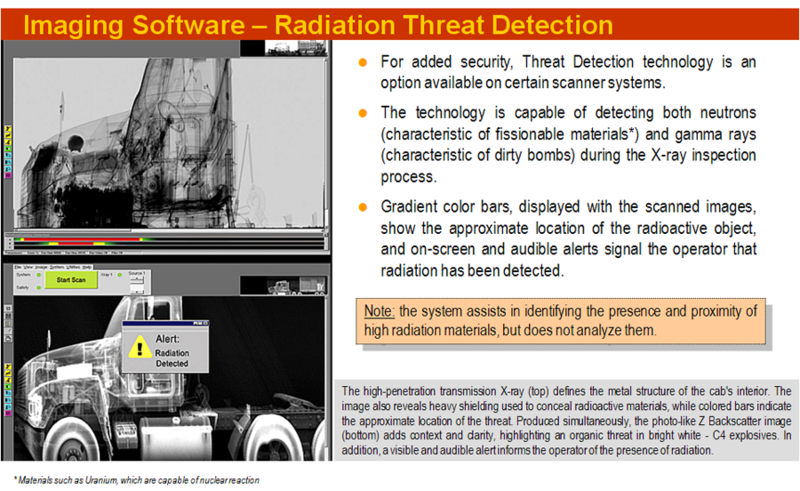 Ability to enable a scanner operator to capture outcome of scan results and notify cargo status (e.g. need for further intrusive inspection, quarantine of goods, or release of the goods) to trader and release authorities. 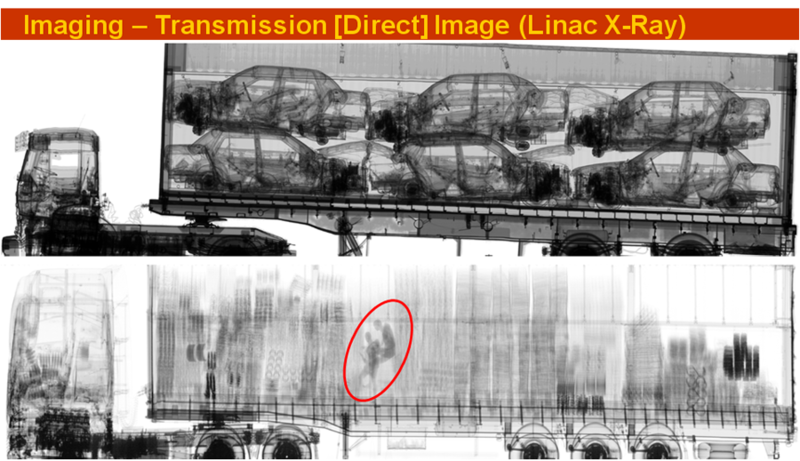 For transit goods, the ability to provide multi-site access to images (port of entry and exit) to facilitate a comparison of ‘entry’ and ‘departure’ images. So where is the Scanner Industry headed? Since the inception of supply chain security, much has occurred in the domain of cargo scanner technology development and manufacture. It would appear that the fit will survive, while others providing niche products or capability will be bought out by the bigger players. Traditionally, prior to 9/11, most of these manufacturers were located in Europe (Smith Detection Systems, L-3 Communications) and the United States (SAIC, American Science and Engineering, Rapiscan). However, the biggest player in this industry today is located in the Far East (Nuctech). There are of course other suppliers, but command less attention than the ones named above. Perhaps in time new players will emerge, or rather the biggest players will continue to absorb the smaller niche players. It is difficult to predict this relatively ‘unknown’ industry, but one thing is for certain – security inspection equipment will remain a key criterion for developing economies attempting to broker trade deals with the industrialised countries. 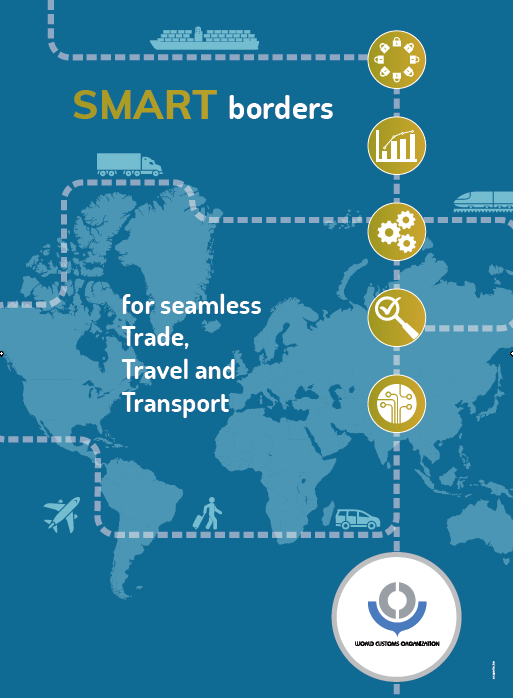 Too much depends on the customs administration’s ability to determine and manage risk, to minimise transactional delays; and to satisfy new customs standards such as WCO SAFE, and Authorised Economic Operator (AEO) schemes offering reciprocal mutual recognition for recognised traders between partnering countries. Technology will continue to play an increasingly important role in the operation of all customs administrations forthwith. Governments will be required to make adequate provision for this financially. Customs administrations will be under pressure to maintain these standards and somehow retain their skills base. In short, Customs is a whole new ball game requiring an appropriate mandate and treatment by its governing administration whether it is resident under a Treasury Department, an autonomous Revenue Authority, or a Border Management Agency. For those interested in more definitive data, I can recommend a visit to Homeland Security Market Research Reports. This organisation provides a lot of insight into the developments in the global x-ray screening industry. Be aware their research chronicles do come at a price, but the cost is well worth it your organisation or government intends financing a port security programme.